Grizzly bears continue their vicious assault on automobiles, this time in the Great White North. Stephen Colbert once said "I believe all God&apos;s creatures have a soul....except bears." 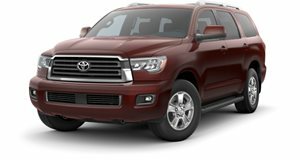 Well in this particular case, a young grizzly showed his true nature to a Toyota Sequoia Platinum Edition in Canada and racked up $60,000 worth of damage. It was written off after the aforementioned price, as a new Sequoia of this caliber runs nearly $70,000. As Colbert might say, the bear "pounced on the Sequoia like happy Germans on Poland." The bear was apparently wandering through the forest when he came across the Toyota. He manged to get the door open and once he crawled inside, the wind blew the door shut. Trapped inside, the bear went....bear all over the SUV. The door panels, headrests, leather seats and dashboard were all torn to shreds. Two airbags deployed and were succinctly destroyed, the other four were also ripped apart. Needless to say, all the wiring was ripped out and torn. The damage was so bad, in fact, that the head mechanic at Calgary Toyota said he didn&apos;t know if they could even repair the SUV. Then the bear defecated in the back of the Sequoia. Seriously. The story comes from FlyFishAlberta, where the author says that his friend&apos;s brother (who originally sent the email) noted that the bear was probably a 3-year old grizzly according to DNA taken from the Toyota. That means a young, vicious monster is on the loose in Canada and we don&apos;t have much time to stop him. And Alberta thought they only had the Sasquatch to look out for.